“Do lobsters want to fly? 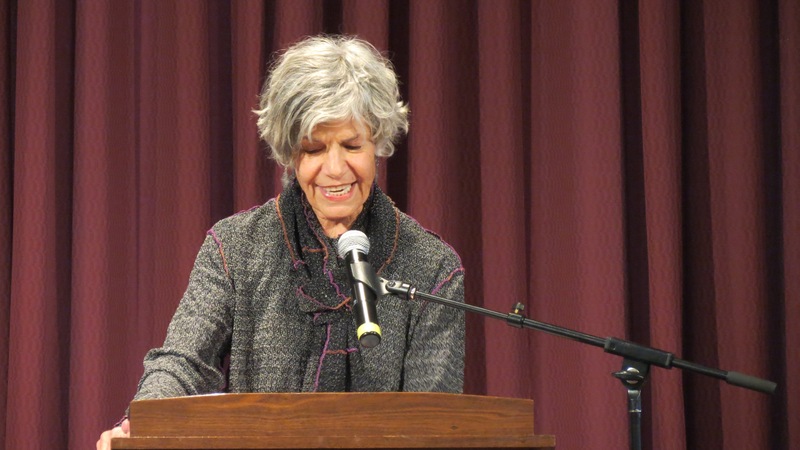 Of course,” Stamberg said, relating the tale to the audience at UM, gathered for the School of Journalism’s annual Dean Stone Lecture. Each spring the UM School of Journalism honors its founder, Dean Arthur Stone, and current journalism students with a two-night celebration featuring a guest lecturer followed by an awards banquet. Miss Lily told Stamberg about a certain loneliness that she saw in people that she hoped to ease by getting more strangers to talk to each other. As a journalist, Stamberg related to Miss Lilly’s mission because she always tried to take her interviews with people to a more intimate level and advised students to do the same. 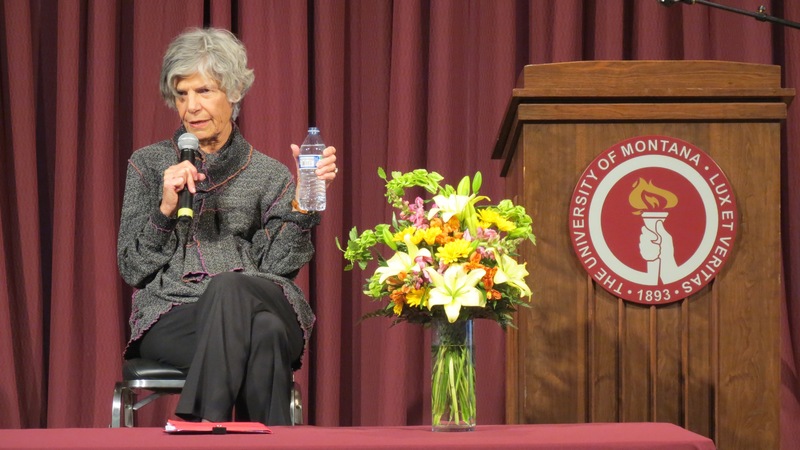 Susan Stamberg took questions from the audience after her talk. Photo by Alyssa Rabil. Yet having now worked at NPR for 45 years, she credited her genuine curiosity to the fact that she’s a life-long learner. After growing up as an only child, Stamberg also maintained her desire to reach out to new people, understand and befriend them. Stamberg took the time to listen to parts of Banville’s class’s brand new podcast series, Rest Stop Radio, offering feedback and sharing in their excitement. The Bakken oil boom brought more than just economy to northeastern Montana, it also increased the amount of human trafficking on the Fort Peck Indian Reservation. Bronte Wittpenn, a current senior, realized this when she took Native News last spring and wanted to try to tell that story. However, her research revealed that the trafficking was related to the larger issue of domestic and sexual violence, which had been prominent on Fort Peck for generations. Wittpenn’s resulting multimedia story, “A Brutal Tradition,” recently won 9th in the Hearst Awards’ Multimedia II and News category. 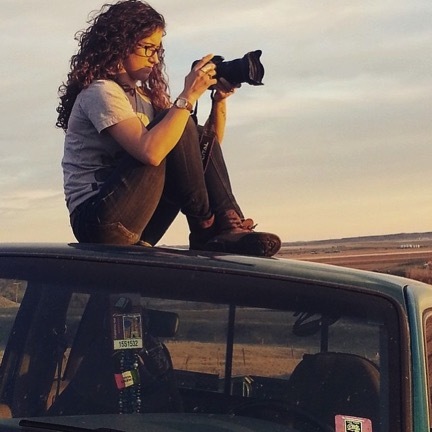 Her video and photos accompanied a written piece produced by her reporting partner Jesse Flickinger, who traveled with her to Fort Peck. During interviews, they had to ask their characters challenging questions, asking to them to talk about personal experiences with sexual assault. Wittpenn discovered the story’s main character, Toni Plummer-Alvernaz, when she was working for the Montana Native Women’s Coalition and trying to generate more awareness of the issues and resources for the victims. Plummer-Alvernaz’s mother, also a victim of domestic abuse, supported her emotionally but didn’t enter the activism arena. The story of three generations came together with Plummer-Alvernaz’s daughter, who has been following in her footsteps, determined to break the tradition of abuse. “Bronte and Jesse conducted good interviews and did a great job connecting the dots,” said associate professor Jeremy Lurgio, who co-teaches Native News with assistant professor Jason Begay. Flickinger’s written piece was a finalist in the Society of Professional Journalists Mark of Excellence Awards for the in-depth reporting category. And while Wittpenn’s excited to receive recognition for her multimedia piece in the Hearst Awards, she appreciated the enthusiasm of Plummer-Alvernaz and her daughter once they saw the finished project. Wittpenn’s most recent multimedia project, “Living Under A Lawsuit,” has been entered into next years Hearst Awards competition. She produced the story as part of the Pollner Seminar, taught by experienced editor and photojournalist Sally Stapleton. After graduation in May, Wittpenn hopes to get her EMT license and volunteer locally before taking her camera on a South American adventure in the fall. Her previous travels include Morocco, France and a year abroad in Barcelona, Spain. Wittpenn said those experiences have helped her become a better journalist by making her feel comfortable adapting to situations where things don’t go as planned. Follow the latest stories behind Bronte Wittpenn’s lens via Instagram and Twitter, or check out her full multimedia portfolio on her website. A week ago, the Society of Professional Journalists (SPJ) released its Mark of Excellence awards, and 15 UM journalism students were announced as category winners in Region 10, encompassing Alaska, Idaho, Montana, Oregon and Washington. Yet even more J-school students received acknowledgment for their work, recognized as finalists in those same categories. “The wide range of projects that we’re being noticed for includes the entire spectrum of journalism, covered in these awards, and that’s pretty cool,” Ray Ekness said, professor and director of student success. SPJ set their standards high and stated that in their contests, if none of the entries received rose to a level of journalistic excellence, they would refrain from giving out that award. However, UM students rose to the challenge and received recognition in categories that covered photography, reporting, writing, radio, online and television pieces. Six of these students were selected for at least two different projects, and some even received awards in different mediums. Swibold cited senior Sojin Josephson as the apex example for accomplishing exactly that. Josephson won in the sports writing category and was a finalist in the television feature and television general news reporting categories. Her winning piece, “Kicking and breathing: Daniel Sullivan’s body quit football, but Sullivan couldn’t quit the game,” which she wrote for the Montana Kaimin, will go on to compete at the national level. The 14 other winners also compete at the national level against students from different regions and recognized in the same category. Not only were students’ individual projects honored, but the SPJ recognized UM’s Student Documentary Unit and the UM News class for their collective work. The UM School of Journalism is currently ranked 8th in the nation and celebrated its centennial birthday in 2014. National winners in the SPJ 2015 Mark of Excellence Awards will be announced later this spring, and will be honored at the Excellence in Journalism convention in New Orleans, running from September 18th-20th. The complete list of Region 10 SPJ awards results is available on their website.